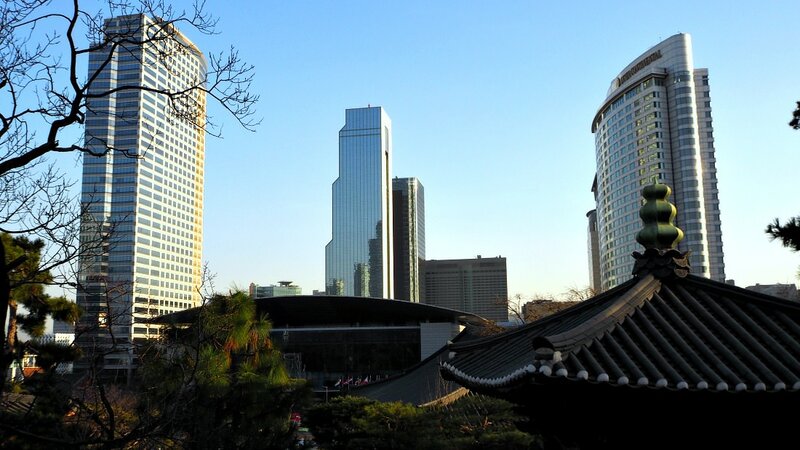 The 63 Building (or Yeoksam Building) is once the tallest building in Seoul. 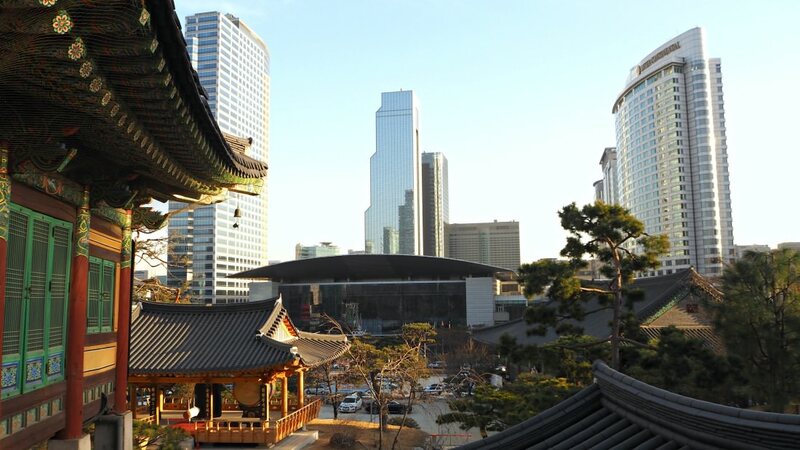 It is one of the eye-catching landmarks in Yeouido that offers spectacular vistas of the capital city. 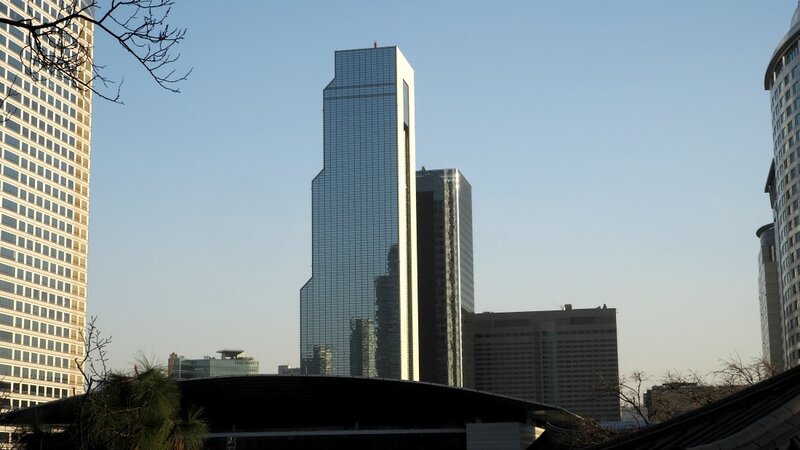 With the completion of Lotte Tower, which stands over 100 stories tall, 63 Building is now just ranked the second tallest building in the country. 63 Building stood 249 meters (around 817 feet) high and comprised of 60 floors and three basement floors. I could not forget the first time I explored the building with my friends during my first few weeks in Korea. For one, I was amazed to watch my first IMAX cinema experience in this very building. Another interesting physically feature of the building is its glass elevators. These elevators do not only serve as lifts but also as viewing observatory. It ascends at 460 meters per minute, and it only takes 25 seconds to reach the top floor. Further, 63 Building is distinctively colored in golden yellow. It might surprise you to know that the gold color is a real thing: each glass pane is coated with a thin film of 24-carat gold. The 14,000 panes reflect the sunshine with gold, red, and silver colors during sunset. This appearance makes the tower distinctively stunning to the viewers! Citizens of South Korea pay an extra 1,000 won. Open until 21:10 on Monday and 1st and 3rd Tuesday of each month. With all such features, the building used to be the hottest place among families, friends, and a favorite spot for dating. Aside from the attractive features and facilities of the building, you can also explore more exciting and relevant sites, historic places, entertainments, restaurants, businesses, green public parks, arts and exhibitions, and relaxing spaces. In Yeouido area, you will easily find accommodation with various fantastic facilities and services. Taxis in Seoul are available 24-hours daily. If you are not so sure about your address better have it with you in case communications fail (in Korean). Also, have your address details in the Korean language (and English) as much as possible. The Seoul Subway is a very efficient public transport. It is the quickest way to navigate and find places in Seoul. Yeouido Station (subway lines 5, 9) exit 5, then take the free 63 Square shuttle bus. Alternatively, take Bus 62 from St. Mary’s Hospital platform for the tower. Yeouinaru Station (subway line 5) exit 4, then take the 63 Square shuttle bus located left of the intersection. Take Subway Line 1 to Daebang Station (Exit 6). Then take the free shuttle bus or Bus #62 for the building. The multi-service tower is open all-year-round, except during special national holidays. Please, let me know should you have specific questions regarding the contents of this article. Hope this is helpful.